Tie Tie a red ribbon around a birch tree for a an easy and sweet Christmas card. Cammie used the Stampin Up Woodlands Textured Impressions Embossing Folder # 139673 on whisper white cardstock and used her soft suede pen to make the birch trees stand out. She added red foil #139607 bows cut using the Wonderful Wreath Framelits #135851. 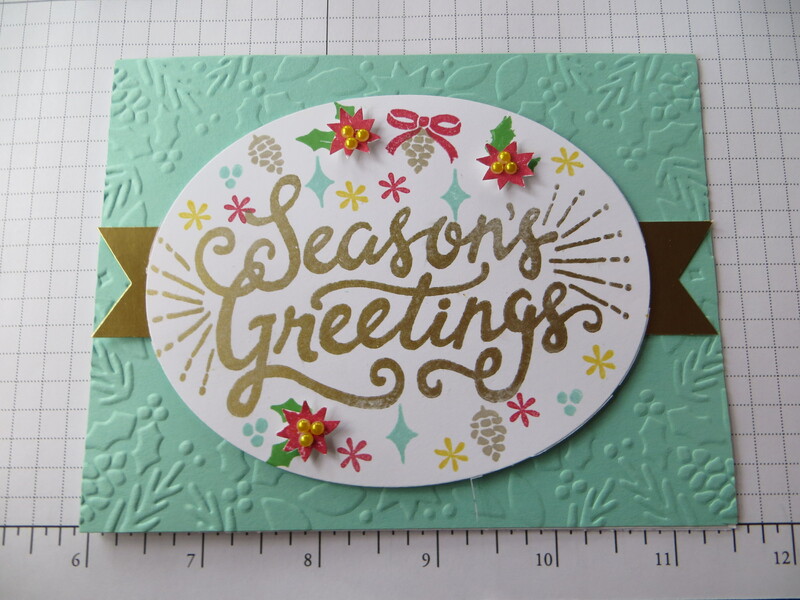 The sentiment is also from the Stampin Up Wonderful Wreath Framelits set. This card is perfect to make a stack of cards to get your Christmas cards done quickly. I love it when both Cammie and I come up with similar cards using mostly the same products. Today’s post is just that. We both used the now retired Gold Soiree DSP and the Bright and Beautiful Stamp set also retired from Stampin Up. The start were cut using the Star Framelits #133723. Cammie stepped her card up by adding the red foil#139607 star mats. We both blinged them up using rhinestones#119246. ving Living in Columbus Ohio there is no professional football team but then again the OSU Buckeyes come close. Saturdays in Columbus are big football days but there is no bigger game than the rival game against that team up North. This year the game is being played in the Big House so today I am paying tribute to my alma mater with a Scarlet an Gray card that resembles the buckeyes helmet. Let’s go Bucks! Well its Black Friday and the shoppers are out and about. That is one scene that I have never gotten into. I don’t need anything that bad to fight the crowds and the traffic. So today, I am posting a simple black and white card with a gold Satin bow and a sweet tag using the now retired You Brighten My Day stamp set from Stampin Up. Happy Black Friday! Bring on the Holidays. Tom the turkey made the debut as one of Cammie’s premiere Thanksgiving cards. She primarily used the now retired Stampin Up Daydream Medallion stampset and the coordinating Floral Frames #127012 Framelit dies to dress up Tom’s feathers. The rest of the darling turkey was made using lots of other Stampin Up punches and dies . Once assembled Tom is mounted on a Woodgrain #127821 textured background. To coordinate with the adorable card, Cammie made adorable Tom the Turkey party favors using the Stampin Up Curvy Keepsakes Die as the base treat holder. Gobble Gobble Gobble! Happy Thanksgiving one and all. To show our gratitude, we will be posting 2 posts today. This card features the Lighthearted Leaves #139712 photopolymer stampset from the Stampin Up 2015 Holiday catalog. Cammie used the sample in the catalog as her inspiration. She added a the sentiment stamped on a leaf cut using the coordinationg Leaflets Framelits die #138283. For the second card, Cammie kept all things the same but just switched the orientation from landscape to portrait. Stay tuned for a turkey post later today. It’s the 25th day of the month so as promised I am posting a Christmas card. This card is a near direct CASE (Copy And Steal Everything) from the Stampin Up 2015 holiday catalog featuring the Boughs and Berries bundle. The background was textured using the Boughs and Berries #139671 textured impressions embossing folder. I added a gold banner beneath the main focal piece. For the centerpiece, I cut an oval using the Stampin Up ovals framelits #129381 and then went to town stamping little bits from the Berry Merry stamp set #139768.